Great game worlds come in all different forms, each perfectly suited to their designers’ unique vision. Past Aggie winners for Best Setting have ranged from extraterrestrial landscapes made of clay to paper scenes from a pop-up book to vector art environs in a modishly muted palette. 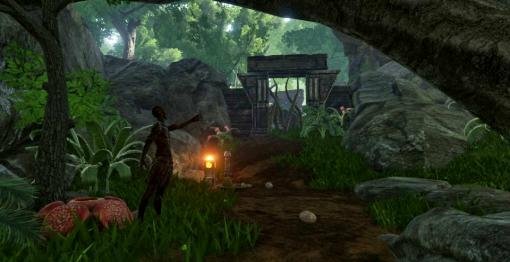 White Lotus Interactive’s XING: The Land Beyond claims this year’s award by going in another direction, establishing its own distinct ambience through spectacular 3D hyper-naturalism based mainly on regions from good old planet Earth. Better yet, its jaw-dropping beauty comes with brains to match, as scattered throughout these monumental locales are expertly melded puzzles that channel players through the life stories and philosophies of four vastly different individuals. Beginning the game dead, a surreal extra stop in the afterlife greets you with massive floating boulders, spores adrift in the air, and arching blue stars in the skies above. From there a portal leads to an exotic Pacific island, a lush jungle, a mountain ridged with pagodas, and a desert girdled by stone parapets. Each is linked to a historic culture, accompanied by ethnically diverse music and adorned with artworks and relics. Though these scenic backdrops are (mostly) realistic, you have the otherworldly ability to control the time of day and weather, causing delectable transformations at will. Moonlight is an eerie contrast to bright sunshine, rain and mist soften the gorgeous vistas, and snow sharpens branches and leaves into interlocking crystals. The final purpose of this panorama of graphical riches is brought into perspective by an unusual plot twist, as singular voyages of self-discovery unify nature, art, strife and mysticism into a startlingly new perspective. You can’t help but want to visit these places, and thanks to XING you don’t actually have to die to get there. 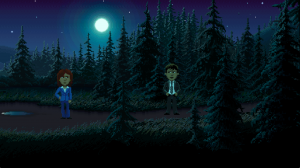 There’s a good reason why Thimbleweed Park is named after its setting; many good reasons, in fact. Though on the surface it may not seem like anything special – fading town set along a dusty stretch of highway, its business district now largely shuttered, its circus and once-flourishing pillow factory closed down – there’s a very distinct sense of place here, where everything seems to be just a little… off. The local populace is deliciously bizarre, and everyone seems to be hiding a secret or six. The many areas to explore, from cemeteries to sewers, convenience stores to creepy woods, are all gorgeously presented in pixel-perfect detail (not a requirement for an immersive setting… but it sure doesn’t hurt! ), and each location has its own set of puzzles and mysteries to uncover. Perhaps the highest compliment one can pay a game’s setting is this: It simply couldn’t take place anywhere else. Well, that and awarding it an Aggie, as you’ve done here. Next up: Best Graphic Design... the envelope, please!